The intermittent eruption of lava in the Leilani Estates subdivision in the lower East Rift Zone of Kīlauea Volcano accompanied by toxic fumes and fountains up to 100 m (330 feet) high continues. A total of 11 fissures have emerged and 30 homes have been destroyed by 04:00 UTC today. The flow of lava has intensified on Sunday, May 6, 2018. Officials issued an emergency alert to Big Island residents at 19:00 local time Sunday (05:00 UTC, Monday) after an 11th fissure opened up. The alert urged residents in the Leilani subdivision between Kupono and Mohala streets to "Go now." Authorities are also warning about dangerously high levels of sulfur dioxide present in the area. "Areas downslope of erupting fissures are at risk of lava inundation. The general area of Leilani Estates remains at the greatest risk," the USGS said. "However, as the eruption progresses, other areas of the lower East Rift Zone may also be at risk." USGS volcano scientist Wendy Stovall said that toxic sulfur dioxide gas spewing near the fissures is at lethal concentrations, adding that lava flows are traveling through the forest, downing power lines. "Few explosions have been heard, likely from propane tanks or methane explosions," she said. As lava inundates the heavily forested area, organic matter burns and releases methane. That methane gas can get trapped in pockets beneath lava flows or underground, and explode out violently, throwing rocks and debris in every direction, Stovall explained. Leilani Estates residents whose homes were still safe were allowed to briefly return Sunday to grab their belongings and medication. They entered through Highway 130 at the Leilani Avenue access point, showing their IDs to get in. Fissure 8 erupted lava fountains until about 02:00 UTC, May 7, and the 'a'ā flow advanced slowly northward through the afternoon, even after the lava fountains shut down, the Hawaii Volcano Observatory (HVO) said in their update released 06:59 UTC today. The flow crossed Ho'okopu Road, a distance from fissure 8 of about 1.1 km (0.6 miles), HVO said. 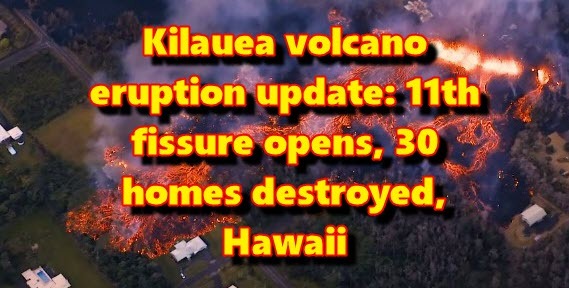 They also reported new ground cracks in the vicinity of fissures 8 and 9 that were emitting thick steam and gases, but no lava spattering was observed. Tiltmeters at the summit of Kīlauea Volcano continue to record the deflationary trend of the past several days. Corresponding to this deflationary trend, the summit lava lake level in Overlook crater dropped about 2 m (6.5 feet) per hour during the day. The lake level has dropped an estimated 220 m (722 feet) since the collapse of Puʻu ʻŌʻō crater on April 30. Rockfalls from the steep crater walls into the retreating lake continue to produce ashy plumes above Halema'uma'u crater. Rockfalls and ashy plumes are expected to continue as the lake level drops. Earthquake activity in the summit remains at elevated levels. In the past 24 hours, about 31 magnitude-2 earthquakes occurred at depths less than 5 km (3 miles) beneath the summit area (compared to the 24-hour period when 152 magnitude-2 and magnitude-3 earthquakes. These earthquakes are related to the ongoing subsidence of the summit area and earthquakes beneath the south flank of the volcano.